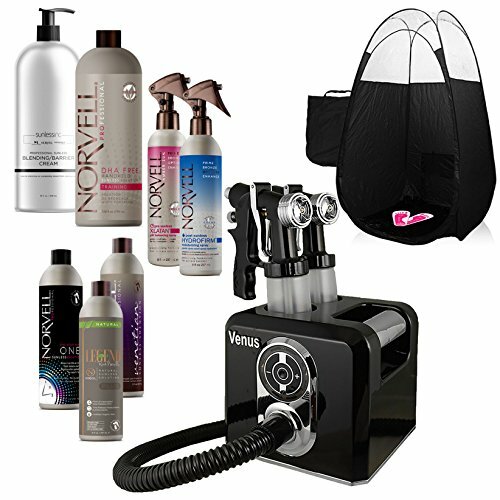 This kit features the Venus Elite Spray Tanning System. This system represents a leap in technical and design refinement in the spray tanning industry and is the standard by which other spray tanning systems will be judged. The Venus Elite has gorgeous styling, from the stunning hi-tech chrome control panel face plate to the gloss finish and contrasting chrome trim accents and carry handle. The unit has two cup recesses built in to hold your spray gun when not in use and to store an extra solution cup. The unit has a removable, washable air filter to ensure clean air intake free of tanning mist that could accumulate and clog your system. Rubber feet allows the unit to sit securely while preventing marring of surfaces. 1 - Black Venus Elite with Salon Styling and easy push button control. Baffled sound enclosure for quiet operation. Two recessed gun holders. Carry Handle. Stunning black finish with chrome trim for luxe salon look. 2 - FX-Design Spray Gun Applicators with Fluid Control Knob, Adjustable Spray Patterns and Low Maintenance and Durable Metal Needle/Nozzle. 1 - 8 oz Venetian Spray Tanning Solution - "Just of the Beach" Mediterranean Tan look; 1 - 8 oz ONE 1 Hour Rapid Develop Spray Tan; 1 - 8 oz Norvell Legend Plus Natural Spray Tan Solution. 1 - 8 oz Norvell XLATan tan prep spray. 1 - 8 oz Norvell Hydrofirm. 1 - 34 oz Norvell DHA Free solution for training and bronzer only applications. 1 - 34 oz Norvell Barrier Cream. If you have any questions about this product by ECV Brands, contact us by completing and submitting the form below. If you are looking for a specif part number, please include it with your message.